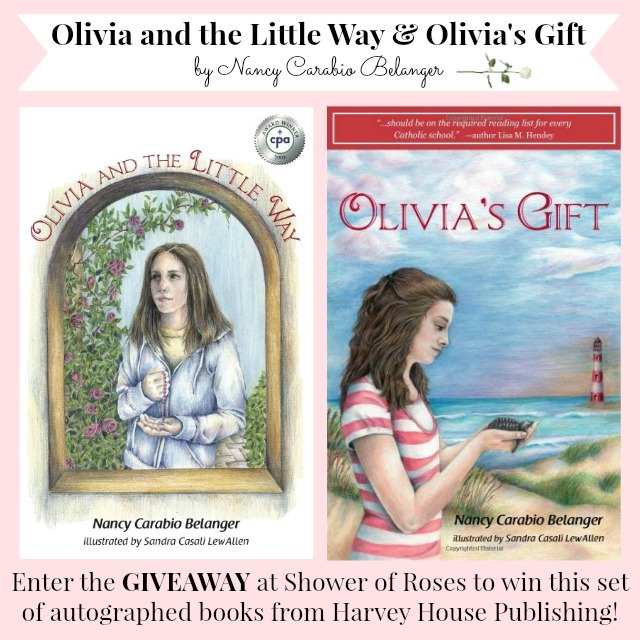 In honor of the feast of St. Therese during this month of October, Harvey House Publishing has offered to send one of my visitors here at Shower of Roses autographed copies of Olivia and the Little Way and Olivia's Gift! I've reviewed both of these excellent books in the past and added them to our girls' bookshelf. Our oldest daughter recently read Olivia and the Little Way and now it's one of her favorites! She just started reading Olivia's Gift, which also includes dear St. Therese and is perfect for Respect Life Month with it's strong pro-life theme encouraging a deeper respect of life. Fifth grader Olivia Thomas has moved to a new school in a new state, and is eager to make friends! Her best friend quickly becomes someone she has never seen—St. Therese of Lisieux. Follow Olivia's trials as she tries to fit in at St. Michael's School. With the help of her grandmother, she learns about the "Little Way" of serving God and how it can change everything! This touching and heartfelt Catholic novel celebrates the life of St. Therese and will inspire young readers to follow her example and discover their own "Little Way" miracles. This engaging story is beautifully accompanied by Sandra Casali LewAllen's stunning illustrations. In Olivia and the Little Way, Olivia Thomas was the new girl in school when she felt St. Therese of Lisieux enter her life. Now her relationship with the Little Flower has blossomed into a beautiful friendship as she prepares to follow the Little Way into seventh grade. School is out for the year and it's time for a fun beach adventure. However, Olivia discovers that sometimes it can be difficult to be a good Catholic when you are in middle school—she discovers she needs God and St. Therese more than ever. In this beautiful novel that celebrates modesty and the precious gift of life, Olivia learns that it takes blind faith every day —and that God is never far away, even on vacation. This captivating story is beautifully accompanied by Sandra Casali LewAllen's stunning illustrations. I've included Amazon links above so you can read additional reviews, but these books can be ordered directly from Harvey House Publishing with optional inscriptions from the author at no additional charge and FREE standard shipping! Click here to buy the books!